We're digging deeper in Week 3 of the Brown Flag Challenge, this time heading all the way down to the southern hemisphere to a couple of islands just southwest of Java and surprisingly far to the northwest of Western Australia. Yes, we're talking about one of Australia's External Territories, the Cocos (Keeling) Islands. Well, here's the kicker right off the bat: the population of the islands is 596 as of July of 2014. Which... hmmm, brings up a question. Is this the smallest population of any territory to have it's own flag? I might have to do some digging on that score, because now I'm interested to find out. Second, let's talk about the whole (name) thing they've got going on here. Per Our Font Of All Knowledge, Wikipedia, the islands have had a complicated naming history. They've been called the Cocos Islands from 1622, the Keeling Islands from 1703, the Cocos-Keeling Islands (1805) and the Keeling-Cocos Islands (from the 19th Century.) I have no earthly idea how they settled on parentheses to settle this, but they did. The Cocos half of the name refers to the plethora of coconut trees on the islands, while Keeling is for a Mr. William Keeling who was the first European to catch sight of them. So, in the immortal words of Paul Harvey: "Now you know... the rest of the story." The flag was first created in 2003 and adopted on April 6th, 2004. It's green, with a palm tree on a gold disc in the canton (the trunk of the tree is where we get our brown from.) The Southern Cross is in the fly and is an obvious reference to their home country, Australia (as well as the Southern Hemisphere). 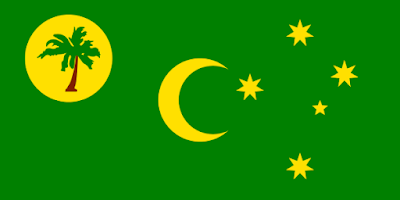 The crescent stands for Islam which is the religion of the Cocos Malays who make up the majority of the population. The green and yellow are Australia's national colors. And that's the flag of the Cocos (Keeling) Islands! Remember, until next time, keep your flags flying- FREAK or otherwise!